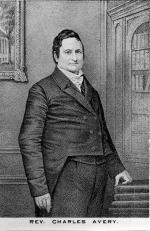 Pittsburgh Abolitionist Charles Avery, circa 1850. It was an act of personal generosity comparable to Stephen Girard's bequest to a school for orphan boys that opened in Philadelphia the year before. Charles Avery's decision to endow a college for free persons of color is one of the less known but fascinating stories of educational uplift in nineteenth-century Pennsylvania. Like Girard College, Avery College, which opened just north of Pittsburgh in 1849, demonstrated the benefactor's faith in education as a catalyst to racial progress in American life. His was a remarkable story in itself. An immigrant shopkeeper who arrived in Pittsburgh in 1812, Charles Avery (1784-1858) made a fortune as a wholesale apothecary and cotton merchant in the decades prior to the Civil War. While on one of his frequent buying trips into the South, Avery was overcome by the plight of slaves and experienced something of a religious awakening. The lay Methodist minister soon became an ardent abolitionist and actively assisted the escape of runaway slaves on the Underground Railroad. Avery supported the African colonization program, gave financial assistance to the new nation of Liberia, and was outspoken in his denunciation of the 1850 Fugitive Slave Law, which required the return of runaway slaves to their Southern masters. A three-story brick structure was erected according to Avery's specifications, with the top floor reserved for Christian education. Legend has it the basement was used as a station on the Underground Railroad. The same year Charles Avery died (1858) the Allegheny Institute became Avery College, with the intention of offering a liberal arts education "in the various branches of science, literature, and ancient and modern languages." Woodcut from the American Anti-Slavery Almanac, 1839. Like many fledgling colleges in mid-nineteenth century America, Avery College faced enormous obstacles. It appears the institution was a "college" in name only, with few students prepared to succeed in the classical course of study. Furthermore, trying to operate a start-up school for free persons of color on the eve of the Civil War was a tremendous challenge in itself. Schools like Ohio's Oberlin College and the newly established Ashmun Institute (today's Lincoln University) in Oxford, Pennsylvania, were better prepared financially to meet the educational needs of eligible students. Though the records are scant, it appears that Avery College suspended operations in 1873, the year of a great nationwide financial panic. Trustees considered selling the school property to the University of Western Pennsylvania (University of Pittsburgh), which had reluctantly accepted Avery's donation to assist in educating a handful of African-American students. Nothing came of the negotiations, however, and Avery College never reopened. As late as 1908, the trustees were debating whether to establish a manual training school or a hospital and nursing school facility on the property. Years later the original three-story building was demolished to make way for a new highway project. 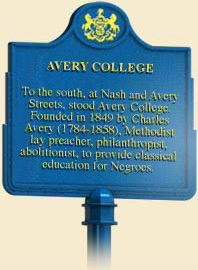 Although Avery College operated for barely more than two decades, the institution was an ambitious humanitarian effort to provide educational opportunity for free persons of color. Charles Avery's personal role in the struggle against antebellum slavery laid the foundation for this equally important experiment in educational and social improvement. Avery College's remarkable though largely unknown story complements the equally compelling personal transformation of its chief benefactor. Adam Fairclough, Teaching Equality: Black Schools in the Age of Jim Crow (Athens: University of Georgia Press), 2001.